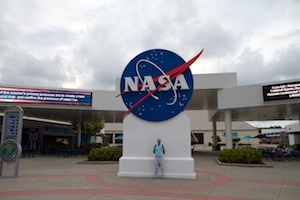 Today, I visited the Kennedy Space Center Visitors Complex. I spent about 10-hours there, seeing everything I could possibly see. I got up early and arrived just after the doors opened at 9:00AM. 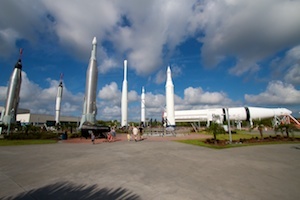 I checked the schedule and saw that there was a tour of the Rocket Garden starting at 9:30, so I started my day there. The rockets include: Redstone (Mercury suborbital flights), Altas (Mercury orbital flights), Atlas (Gemini Agena program), Juno I and Juno II (Explorer, Pioneer), Thor-Jupiter (Echo, Ariel and Telstar programs) and a Saturn IB. The Saturn IB is basically a number of the Redstone rockets bolted around a central liquid oxygen tank. There used to be a Titan II as well, but it fell over in a wind storm a few years ago. After the tour, I stopped at the F-1 engine, which was the model that powered the Saturn V first stage (S-IC). It’s a massive motor, made to the limit of the technology of the 1960’s. Next to the F-1 was a gantry arm from the Apollo program. This arm was used at the launch pads for all of the Apollo moon shots. Every man who went to the moon (except Apollo 10) walked down the arm at Launch Pad 39A and entered the Command Module. Behind the Rocket Garden is the Early Explorers pavilion. In the main lobby is a Soyuz spacecraft (of unknown heritage – presumably never flown in space) next to one of the original Goddard rockets. The original Mercury launch control consoles are preserved here as well. The technology at the start of the space program was amazing in its primitiveness what we have today. But what we have today is built on what was learned back then. In the next room was a never flown Mercury capsule. After that was the Gemini 9A spacecraft flown by Tom Stafford and Gene Cernan for their three day mission. Their mission included a docking with an Agena target (critical for the moon orbit rendezvous requirement of the Apollo mission) and an EVA to test a manned manoeuvring unit (a predecessor of of the MMU for some Space Shuttle missions). The heat shield shows the off-center blasting of the heat and friction of reentry. Finally, near the exit, was a moon suit with Neil Armstrong’s name on it. I took so many pictures, but I think it must be a backup suit, as it was otherwise unlabelled and looked pristine [note: yes it was a backup suit, not Neil’s used suit]. Next I boarded a bus for a tour of the rest of the Kennedy Space Center. The bus went by the two launch pads (39A and 39B) and then stopped at a good observation post. Passing by Pad 39A, where STS-132 had launched 2 days before, it looked like it was scorched from the launch, which is not unexpected. One other site that is interesting was Launch Complex 40. This site was being prepared for the first launch of the Falcon 9 rocket by SpaceX. This is a commercial space rocket. SpaceX has won a contract for resupplying the International Space Station. This is an example of the commercial space transportation that President Obama is using as a replacement for NASA’s Constellation program. Next, we drove by the Shuttle Landing Facility (one of the longest runways in the world) and then to the Vehicle Assembly Building. The building used to allow visitors during the Apollo program, as the Saturn was assembled unfueled. However, with the Solid Rocket Boosters used for the Space Shuttle arrived filled with the solid fuel. So there are no longer public tours of the inside. 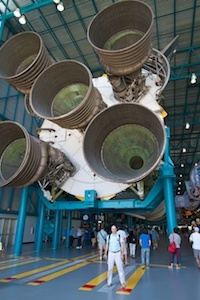 The next stop was the Apollo / Saturn V Center, one of the highlights of the tour for me. After becoming engrossed in the Apollo program last year, this was the second most important place to go for my NASA vacation in Florida. At the entrance was a video overview of the Apollo program. Next, the group went into a simulation of the Apollo mission control, including a launch. During the launch, the windows rattled and the floor shook from the deep rumble of the launch. It gives just a hint of the massive forces of a Saturn V launch. Finally, we were released into the rest of the Center. Hung from the ceiling was a restored Saturn V rocket. What a sight! This was the reason I rented the Canon 10-22mm lens. The five F-1 motors tower over one end of the building, soaring 10 meters up (10 meter diameter). This S-IC stage is 42 meters long. The power of the 7.64 million pounds of thrust were transferred and balanced by the 3039 metric ton mass of the fully fuelled rocket through a 21-ton thrust structure. The S-IC stage lifted the craft only 61km before being discarded and left to tumble ballistically into the Atlantic Ocean. But that short 168 second burn is enough to get the rocket above most of the atmosphere and impart a velocity of 5,350 mph (2,390 meters/second). By the time of the staging of the (now empty) S-IC, the rocket is reduced from 3039 tons to 760 tons – the S-IC is a massive part of the vehicle when fully fuelled. Near the interstage between the S-IC and S-II (second stage) was a Lunar Module (LM) that was intended for Apollo 15 but was not used. I wish it had been closer to the ground so I could get a better look. It is so amazing to think of that little, fragile craft as the only place of refuge on the entire surface of the moon – that that little craft would have contained the entire atmosphere and population of the Moon. I stopped for lunch under the LM (french fries with BBQ). There was a nice view out the window of both Pad 39A and 39B. I continued with the Apollo exhibit hall. At the entrance is the Apollo 14 Command Module (CM). The CM is the only part that returns to Earth. Of the 3039 tons launched, only about 6 tons return. The CM is scorched from the heat of a lunar mission reentry – it is the highest reentry speed of any manned mission. Around the hall are other components, such as tools, check lists and returned moon rocks. Another highlight was Alan Shepard’s moon suit. 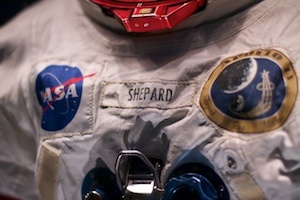 He wore it for the two Apollo 14 EVAs. It was still covered with lunar dust. Leaving the exhibit hall, I stopped to look in to a mock-up of the interior of a Lunar Module (LM). It’s so tiny. As I said before, this was the home of two people for three days on the moon. It would have been incredibly crowded. I imagined what it must have been like looking out of the window onto the desolate, entirely lifeless landscape. I cannot imagine, even with the hammocks introduced after Apollo 11, how anyone could have slept, knowing where they were and what was just outside that thin metal foil shell. Nearby was a Lunar Rover replica. Further down the building was the S-IVB (third) stage of the Saturn V. It was unique in the stages, as it had to be re-started after 2 orbits to push the mission out of the Earth’s gravity well during translunar injection (TLI). At the far end was unused Command Module and Service Module. Next to that was the bus that carried the Apollo astronauts out to the launch pad – very 60’s styling! One final stop was the moon rock. There is a moon rock, mounted in an anti-theft housing, that anyone can touch. Which I did. It was amazing to touch this primordial stone, which sat on the moon for nearly 5 billion years before being collected and brought to Earth. I returned to the bus area, where I had a choice. Either I could return to the Visitors Complex, or I could take an optional (free) tour of the Space Station Processing Facility (SSPF). Calculating how much time it might take, I chose to see the SSPF. On the way to the SSPF, we drove by the VAB again, and by the three Orbiter Processing Facilities (OPF). When each Orbiter returns to Kennedy (either from the nearby landing strip or an alternative landing site), it enters an OPF for examination, processing, refurbishment and testing. The payload for the last mission is removed, but the new payload is not mounted until the Orbiter is on the launch pad. The shortest time for processing was Atlantis, which spent only 26 days preparing for STS-61-B. Two of the buildings are empty with the wind-down of the Shuttle program (Atlantis was in orbit on its final mission) and the loss of the Columbia in 2003. The other two buildings contained Discovery and Endeavour preparing for the final two Shuttle missions. Behind the SPF buildings, and near the VAB was the unfinished launch tower for the Ares missions, part of the cancelled Constellation program. The SSPF is where all Shuttle-delivered modules for the International Space Station (ISS) are prepared. It is basically a huge clean-room where the modules are finished, tested and prepared to be attached in the Shuttle payload bay. 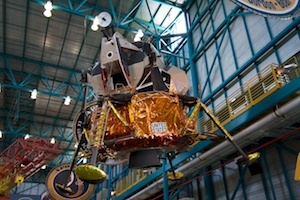 There were three modules in the hangar-sized room – Leonardo and two EXPRESS modules. By the end of the year, all three would become part of the ISS. Returning to the Visitors Complex, I went to the Robot Explorers exhibit. I am fascinated with the success that NASA has had with the Voyager, Pioneer, Viking, Galileo, Cassini missions and the Exploration of Mars. I had hoped to see some of the samples or mock-ups, but the exhibit was entirely geared towards small kids, so I left after only 10 minutes. I walked around to see the Space Mirror Memorial, which has the names of all of the American astronauts who died during training or during missions. 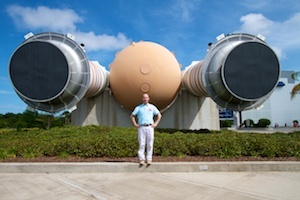 Next, I walked around the mock-up of an Orbiter and the External Tank (ET) and Solid Rocket Boosters (SRB). The day was getting close to the end, so I had one final choice. I could either stand in line to ride the Shuttle Launch Experience, or see an IMAX movie. I chose to see an IMAX movie over the ride. There were two IMAX movies playing. I went to see the one about the Apollo program “Magnificent Desolation” over “Hubble 3D“, as I knew that the Hubble movie would be playing in Ottawa (Museum of Civilization). It was a good movie, considering that IMAX or 3D was invented at the time of the program. The simulation of what an astronaut would see as he descended the lander of the Lunar Module and stepped onto the moon was especially moving to see. Finally, it was time to shop at the gift store. I looked at everything. I focused on the unique items at the gift shop that were not available through Amazon. Most of the interesting books or videos I already had, or were on my Amazon wish list. Instead, I bought a nice white souvenir T-shirt for STS-132, the STS-132 souvenir book and some nick-nacks like magnets and posters. I wanted models of the Saturn V and Shuttle, but the ones they had were either very cheap, or too expensive to afford. The Saturn V model I want is the one I saw in this video from Neil deGrasse Tyson: http://www.youtube.com/watch?v=aadYN5OPKN8. Finally, on my way out, I saw the Orion Crew Module, which is part of the cancelled Constellation program, and had a final picture taken in front of the NASA logo. My day at Kennedy ended about 10 hours after I arrived. I feel I was able to see all that I could see. It was very important to me as a space junkie to be able to see the vehicles and components that I had thus far only read about. I was able to explorer the NASA missions of the past 50 years from the Mercury missions through to the two final Shuttle flights, and a glimpse of the (now cancelled) future Constellation program. One final note that made the day even more enjoyable. Over the PA in the Visitors Complex, they were piping in the live radio communications and Press Officers commentary from the Atlantis as it approached and docked with the ISS. It was icing on the cake – to hear the mission that had begun two days earlier with the launch that brought me to Florida.